by John D. Callahan, Copyright © 2003 by Faith & Reason Ministries. Of Christ's many recorded words, only a minute few concern the Creation Story and the Flood. The entire Gospel of John makes no mention of the Creation Story or the Flood. Luke quotes Jesus, "So the people of this time will be punished for the murder of all the prophets killed since the creation of the world, from the murder of Abel to the murder of Zechariah, who was killed between the alter and the holy place" (Luke 11:50-51). A similar quote is found in Matt. 23:35, but Jesus does not specify "the creation of the world" (just Abel) and refers to "all innocent men" rather than "the prophets." The allusion, to this one comment, is not given in Mark or John. Finally, Mark quotes Jesus, "But in the beginning, at the time of creation, it was said, 'God made them male and female'" (Mark 10:6). A similar quote is found in Matt. 19:4. These are the only remarks Jesus supposedly makes regarding the Creation Story and the Flood. Do we scrutinize Jesus' deity, accepted science, or the above words? There are mountains of evidence supporting Jesus' deity (including miracles and God's power in the Christian's life) and accepted (correct) science. There are only sparse, minuscule words supporting the idea that Jesus took the Creation Story and the Flood literally. Obviously, the words are either figurative, not exactly what Jesus said, or simply writer embellishments. 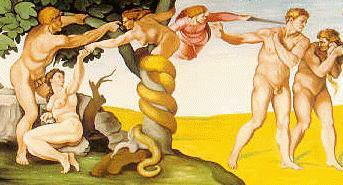 The very fact Jesus spoke little, if any, about Adam, Eve, and Noah is further evidence of His deity.